A villain-centric Batman film that gives us Heath Ledger’s Oscar winning performance as The Joker, and some pretty cool atmosphere and style by director Christopher Nolan. One of the better superhero movies, this one features an amazing performance by Heath Ledger as the Joker. This is the performance Ledger will forever be best known for, (he died shortly afterwards,) and he even won an Oscar for it. And this really is the Joker’s movie. Batman spends the film teaming up with Commissioner Gordon and DA Harvey Dent, trying to stop him, while the Joker takes on the mob and the Gotham judiciary system (he takes out a judge, the former Commissioner, and even targets the mayor.) The movie is fantastic for three quarters of the way through. Then, in the final acts of the film, it kind of loses its way. The Dark Knight is a good, solid Batman movie. It’s regarded by many fans and critics as one of the best superhero movies of all time, and that’s going way too far. The movie is very good, but it’s not great. 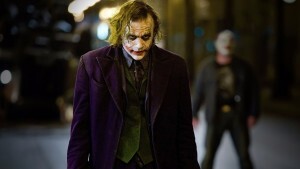 Audiences generally like it so much because of Heath Ledger as the Joker. He steals the show. Ledger died after this performance, in part because of the medication he was on while trying to embody the Joker. And he definitely knocked the role out of the park. Ledger won the Oscar that year for the performance, (after his death.) He’s definitely the best thing about this villain-centric film, but it’s overall a pretty good movie. 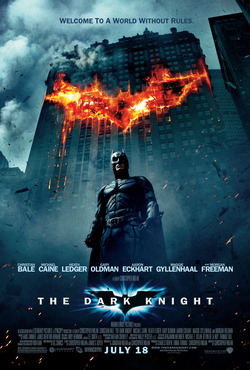 Batman Begins is the better film in the Christopher Nolan series, (commonly known as the Dark Knight Trilogy.) That movie, like the first Iron Man, took the time to establish and set everything up. Both movies were origin films, showing how the character came to be, and both movies took their time with the ways the character was developed. But by the time The Dark Knight rolled around, Batman was already established, and we didn’t need another movie about that. As a result, this film is much more about the villains that it is about the hero, and that’a no necessarily a bad thing. There are two main villains in this movie. In fact, really The Joker is the dominant villain. He’s the star of the show. But then there’s also Two Face, and in many ways this is the story of Harvey Dent’s Two Face. That’s where the movie goes wrong. Ever since Batman Returns, all those years ago, going back to the early nineties, superhero movies have felt that they need more than one villain. Most of the time, the first movie in a new series avoids that trap, (be it Spiderman, Blade, Iron Man, or most other superheroes,) and that’s because they need to spend time giving us the origin of the character, and don’t have enough time for two villains. But there’s no reason why sequels can’t do that too. Two villains are just too much, (perhaps that’s the reason why origin movies like Iron Man ad Batman Begins are some of the best superhero movies around, and are far superior to their sequels. At the start of the movie, we get a bank heist scene that is just perfect. Everything from the music to the specific shots of characters zip lining onto a roof, is terrific. And the way this sequence is meant to introduce us to The Joker, yet it also holds us back from actually seeing the Joker for as long as possible, is brilliant. It builds our curiosity, while we listen to other characters (the ones in clown masks who are robbing the bank and were actually hired by him,) talk about the Joker. Everything we need is established in this scene, from why he wears makeup to what kind of bank he’s robbing, and why its such a crazy job, (he’s robbing a mob bank, that doesn’t even call the police, but instead dials out to a private number.) And by the end of the sequence, we have the great reveal of the Joker, and really his first and only line of the entire scene. It’s hard to follow that amazing introduction scene up, and this movie never does quite match it, (kind of like how X-Men 2s best scene was the one where we first saw Night Crawler attacking the Oval Office, and how the movie was never able to match that scene again.) Still, there’s plenty of other great Joker moments and scenes in this movie. In fact, the entire first half or so of this film is superb, and that includes and is especially true about every Joker scene. The Batman scenes, (like our first scene of him taking on criminals in an underground garage,) just can’t compete. With the Joker, we are endlessly curious, and what’s brilliant about this movie is that it never actually gives us the answers. The actual origin story of how the Joker came to be, and how he got the scars he has on his face, are intentionally unclear. It’s not that the movie doesn’t answer them, it’s that instead we get multiple versions of how it might have happened, to the point of not actually knowing the truth. He tells different stories to nearly everyone he encounters, and that only makes us more curious. Similarly, the movie never gives him a real name, or talks about what he was like before he became the Joker, (other than these stories that he tells, which could very well all be made up.) We don’t see the Joker behind the scenes, working with his men or planning anything, the way we did in the Jack Nicholson version. And all of this works to the Dark Knight’s advantage. The story behind this movie is not only about Batman taking on the Joker, but also taking on the mob. And it’s not just Batman. He’s part of a group of three men, working together, meeting on rooftops to discuss their plans. The other men in this trio are Commissioner Gordon, (Gary Oldman,) and Harvey Dent, (Aaron Eckhart.) Together they figure out what to do about the mob’s accountant, a man named Lau, who has fled to Hong Kong with the mob’s money, since that city has no extradition. But Batman doesn’t care, and goes to Hong Kong to kidnap Lau, in one of the movies best sequences. If there’s a scene that rivals that Joker opening, it’s this one, right here. The story about our heroes taking on the mob is pretty good. So is the story of how the Joker works his way inside the mob organization, by taking out certain crews, (such as the black mafia,) and also by killing specific targets. He kills judges, police commissioners, and makes threats against the mayor. And these deaths are all pretty scary. Even when the Joker is captured, and locked away in prison, he’s still a threat, and we find out that his men, who are still out on the street, have kidnapped some very important people and are waiting for his orders about what to do with them. All of this leads to the death of a very prominent character, and also the event that turns Dent into Two Face. And that’s when the movie goes south. It’s probably close to the three quarter mark, but everything that comes after this, (from the threat by a guy named Reese who tries to expose Batman on a talk show, to the Joker’s hospital scheme, to the two ferry boats sequence,) is disappointing. Suddenly the plausibility button gets thrown right out the window. For example, the police can’t figure out which hospital The Joker plans to blow up, even through Harvey Dent is sitting in one of them. The approach to Two Face that this movie takes, (not showing us him in trailers, and not even confirming that he’s in this movie,) is great. Movies don’t really do that anymore, and they definitely should. But the actual Two Face character just looks stupid. Way too over the top on the makeup. It’s just one more reason why this movie kind of falls apart at the end. It’s mostly an excellent film, but boy does it lose steam in its final acts. the Dent-Rachel relationship, and the mob having problems keeping their money. Batman, Scarecrow – dogs break through suit. The act ends with a meeting of two mafia organizations, a black mob headed by Michael Jai White and an Italian mob headed by Eric Roberts. This scene also brings in Lau, the Chinese businessman who has now fled to Hong Kong, as well as the Joker. Harvey Dent as the white knight and the future of good. that he can take on anyone who doesn’t take him seriously. with one case. Act ends. This act shows Batman and Harvey Dent and Gordon rise up and take control of the legal system in Gotham. It also shows the Mafia grow weak and desperate. It is a setup act for why the mob might join forces with The Joker. Especially after the Joker eliminates the black mafia. Judge – car explosion, Loeb – poisoned liquor. At the funeral for Loeb, Lt Gordon is killed. This act shows what the Joker can really do. In one swift series of events, he kills off the judge and police commissioner, and even Lt. Gordon. With all of these police and law officials dead, Batman will have to tell the world who he is, just to stop the Joker. Dent is taken away in a police van. The Joker attacks the van. Batman shows up, flips the Joker’s truck. Dent and Rachel are kidnapped separately. This act is about bringing the Joker in. It is in many ways the mid point of the movie. So far, this movie has been all about the Joker out on the street while Batman and Harvey Dent and Gordon were cleaning the streets of the mob. Now, they have finally got their man. Or so it seems. Batman saves Dent from a bomb, but Dent’s face gets burnt. Rachel dies in the bomb explosion. Alfred reads the letter about how Rachel chose Dent. as a bomb and escapes. forward ready to reveal to the public who Batman is. Dent in the hospital, is visited by Gordon and then The Joker. Polar opposites – like being visited by an angel and the devil. The Joker blows up a hospital. In this act, Rachel dies and Dent’s face gets destroyed. The Joker escapes prison. Batman’s choice to save Dent instead of Rachel shows him putting the good of Gotham ahead of Bruce Wayne’s personal love. This act is about sacrifice, and also about how Dent begins his downfall. So far the movie has been all about the Joker. Once they finally get him into prison, it becomes about Dent. ready to take on the people of Gotham. to scan the floors and find his enemy. The ferries don’t blow each other up. The Joker is left hanging. This act is about the end of the Joker. At last, the Joker’s big plan comes out, and Batman has to sacrifice some of his values in order to catch him. He uses the cell phone signals, an invasion of privacy, despite Fox’s objections. By the end of the act, Batman has taken on the Joker, in their climactic battle. Batman shows up and Dent is killed. Batman will take the fall. City and police turn on Batman. This is a strange and extremely dark ending. Instead of ending with Batman getting the Joker and everything wrapping up neatly, the movie goes on for one last act to show what happens to Dent. In this way, the movie gives us two villains, and also shows us that the whole film was really about what would happen to Dent. The Joker’s whole purpose was to get the best Gotham had to offer, and to corrupt him. faced with a choice between saving Dent or Rachel and chooses to save Dent, showing that it is not about what’s best for him, but about what’s best for the city. The Joker is the force of corruption that destroys Dent and tries to destroy the people with his ferry plan. He uses the mob to get at Dent and then uses Dent to prove that even the most righteous can be corrupted. In the end, the people disprove The Joker’s theory by refusing to blow up each other’s ferries, but then Dent shows that the Joker’s plan was not a total loss. It’s a great ending because it completely leaves the movie open for more, and leaves craving the next, and final chapter.